During our recent Champions League match vs. Viktoria Plzen, we finally got a good look at a player who was just coming back from a long-term injury. It was center back Philippe Mexès, who transferred to Milan this summer from Roma after seven years with the Giallorossi. While he is undoubtedly talented, he also has a bit of a stigma as a collector of the red cards, or les cartons rouge, as they say in his native French. Mexès, now 29, was born in Toulouse, France and began his career at the age of 12 playing for Auxerre. He moved up to the first team squad in 1999 and stayed with the club through 2004. He received the nickname “the ram” in 2002 when apparently, during a French league game, he was attacked by a bull. Maybe it was the hair. Kind of makes me see red, too. In 2004, he moved to Roma, but it was not without controversy. Apparently, he decided to move to Roma, but did not get permission from Auxerre. So of course, Mexès was suspended for some time and ended up settling with Auxerre himself, lest Roma should pay € 7 million. Roma were banned from making any purchases in the transfer market in 2005 due to their part in the transfer misconduct, which actually ended up benefitting Mexès, as he had more playing time the following season for it. Mexes tussles with his future teammate while still at Roma last December. At the end of the 2005-06 season, Roma were only slated for UEFA Cup competition the following season. Only they were one of the clubs that very much benefited from the Calciopoli match fixing scandal. So, having finished 5th in the league, after the rulings, they found themselves in 2nd place instead, and on to Champions League competition for 2006-07, where they made it to the quarterfinals. They also finished 2nd in the league, with the 3rd fewest goals conceded, thanks in part to Mexès, and they also beat Inter to win the Coppa Italia. Those same accomplishments were repeated in the 2007-08 season. But in the 2008-09 season, they conceded the 5th most goals in Serie A, not a good stat if you are a central defender. Then in the 2009-10 season, he lost some of his playing time to the on loan Nicolas Burdisso. However before the middle of the next season, he had reclaimed his starting spot. Mexes signals for a sub after fatefully injuring his knee vs. Juve in April of this year. It was this, the 2010-11 season, that would change a lot of things for him. 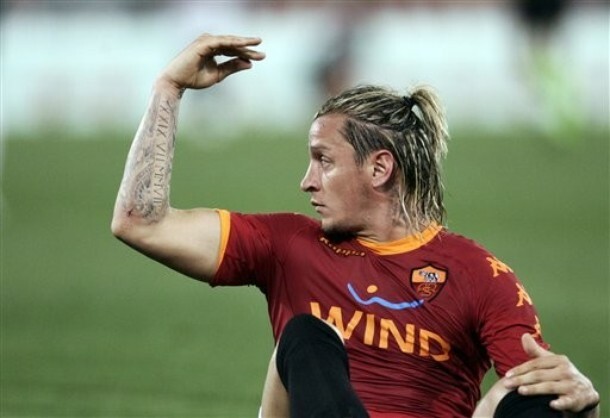 In April of this year, playing Juventus at the Stadio Olimpico, Mexès injured his left knee and had to be subbed off. It was later determined to be cruciate ligament damage, for which he had surgery on 2 days later. His contract was due to expire in June, so it was at this time that he hinted that he may have played his last match for Roma, and he was quickly linked to a move to AC Milan to join former Roma teammate Aquilani. Galliani announced in early May that Mexès would indeed transfer to Milan. This announcement was mixed for Milan fans. Some were thrilled, obviously remembering the quality of defender that he was and concerned over how much longer our beloved Nesta would be able to play. Others were concerned that he was “damaged” goods, and considered it foolhardy to purchase a player who was injured, as you never know if they will be able to return to form given such a serious injury. Still others referred to him as a “walking red card.” When you look at his career for both club and country, in all competitions, he has 3 full seasons of no red cards. But for the other 6 seasons, he averages 2 red cards per season. While I’m sure he’s not the only center back to ever accumulate so many, that is a fairly high number. If you average it all out over all 9 seasons, it’s one red card for every 27.25 matches, which may not sound too bad, but when you consider a player like Paolo Maldini, who only received 1 red card during a 9 year period, playing hundreds of matches, and you can see the difference in class. Mexès checks in on Plzen 's Petr Jiracek, he knows too well about injury. Still, he did recover from his injury as expected, and played his first few minutes in a Milan jersey vs. BATE in mid-October. He then made his Serie A debut for Milan vs. Parma subbing on for about 15-20 minutes. His full 90 minute debut was just this past week vs. Plzen in the Champions League, where I thought he played very well and gave me a lot of hope for what is to come from him. Interesting how injury changes people, though, as we saw him checking in on Petr Jiracek as he was being stretchered off after what looked like an ankle injury he sustained colliding with Bonera. Having had such a serious injury, he probably feels for other players in similar situations. Mexès’ career for his country started out well enough at the U18 and U21 levels. However, a couple of those finicky French coaches saw him left out for periods of time, including some of the big tournaments. Since 2002, he has 22 caps for his country, and has been called up for every match by current manager Laurent Blanc. This March, playing in a friendly against Luxembourg, he scored his first goal for his country. While I worry about the red card ratio, Mexès is a very talented center back, even if his hair needs some serious help. He’s still got enough pace, but has good positioning, even if he makes some rash tackles. He is quite good in the air, and 6’1 ½” (1.87 m) tall, he wins a lot more balls than players even taller than him. He has had a bit of controversy follow him in his career, but he came to the right club to find both peace and success. I assume the latter was what he was after when he left Roma, always finishing 2nd or lower must be very frustrating. So I propose that Milan win a trophy or two for their newest center back. After all he’s been through, it’s the least we can do to welcome our very own le carton rouge.